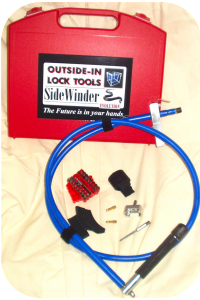 For those who are not familiar with the ‘SideWinder’ from ‘Outside-In Lock Tools’, it is an attachment for the Letterbox Tool, which makes turning night latch knobs, thumb turns and keys left on the inside of a lock, an extremely easy and swift job. Avid users of the ‘SideWinder’ had requested several features that they would like to see incorporated into the ‘SideWinder’, some of which were totally impractical, while others were useful suggestions. Chief on the list was a greater reach, (the original ‘SideWinder’ had 1m reach). A close second on their list was a more efficient system for interchangeable heads, as our original ‘Wishbone’ adapter was somewhat fiddly to fit. Another on the wishlist, was more torque, which was a necessity on lockcases which featured multiple bolts, such as the ‘Hooply’ and ‘Motura’ types, where greater friction was encountered. Initially we considered the use of a battery drill to rotate the drive, but we soon decided that this was an unnecessary complication, which simply induced less control than a hand operated version. Additionally, there was no danger of batteries letting the Locksmith down. 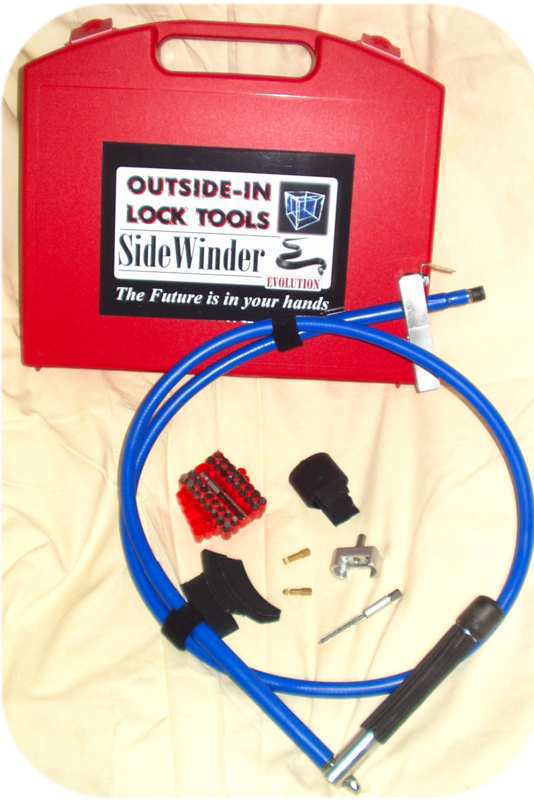 ‘Outside-In Lock Tools’ set about attempting to include these features into a new ‘Super SideWinder’, which had a reach of 2m. Unfortunately, this turned out to be totally impractical to use, even when shortened to 1.5m. 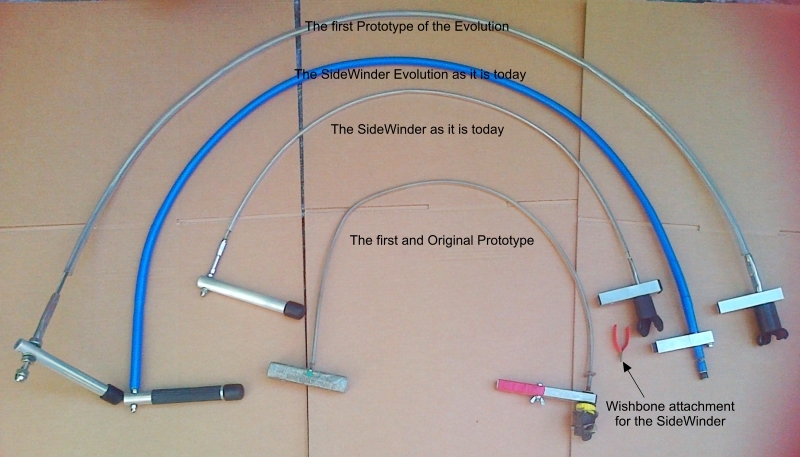 However we weren’t about to give up, and set about reworking the new version from the ground up, – though still using an updated version of our original ‘DirectDrive’; and so the ‘SideWinder Evolution’ was born. We ran a variety of tests to determine the level of torque, including driving a 4” screw into a piece of CLS, which it drove home easily, when compared to an expensive ‘off-the-shelf’ Flexible Drill Driver, which helixed after the first ½” of thread. The optimum length for the ‘DirectDrive’ which was based on the original one used on the ‘SideWinder’, was 1.5m. This offered enough reach to deal with most low-level letterboxes, without helixing, and also produced enough torque for even the toughest tasks. We even found it was perfectly capable of removing screws from door handles etc. through the letterbox. The next feature to tackle, was a more efficient system for interchangeable heads, allowing different grippers etc., to be swapped over when required. ‘Outside-In Lock Tools’ philosophy of keeping things simple, was followed through into the choice of ‘heads’ that we included. We felt it was all too easy to include a lot of over-complicated ‘heads’, which would offer a bewildering choice when faced with latches of unusual shape. As with all our Letterbox Tools, we wished to make one ‘head’ cover multiple levers, knobs and turns. This had the added advantage of cutting down on the possibility of having to remove the LBT in order to swap the head over for a different task, when one head can deal with several situations. It’s a simple, quick-change head system, utilising standard hex section, which thus enables off-the-shelf screwdriver bits etc. to be easily fitted. The necessary heads are included in the kit, along with additional accessories. Although we don’t provide cameras, there is provision for one to be fitted. A bolt is included to facilitate this. We have also ensured that the ‘Evolution’ is 100% compatible with the standard Letterbox Tool. However, the added rigidity and strength of our own ‘Extreme Letterbox Tool Kit’, will offer an advantage, as there is less flex, greater comfort and control. 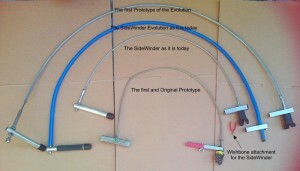 The ‘SideWinder Evolution’ is aimed at busy Locksmiths, who need to gain entry swiftly and efficiently. With a little practice twenty-second openings are commonplace, making the Locksmiths job faster and less stressful when an urgent entry is required. When used with ‘The Rattler’ letterbox tool handle, it makes a formidable combination! We have received a great deal of praise and reviews from Warrant Locksmiths who have told us how the ‘Evolution’ has made their job so much easier.